Here in BC, Terasen Gas plans on hiking our rates again this month, this time by 13.3%. I don’t usually jump up and down about this kind of thing, I’m pretty much resigned to the notion that if the price of natural gas goes up, Terasen will pass those costs on to me as quickly as possible. But in the mail came this ridiculous form letter, and now I’m ticked. 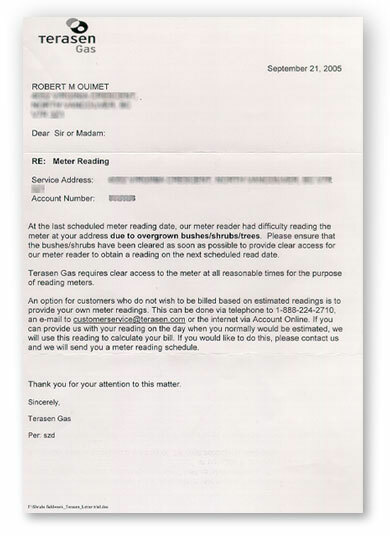 I wouldn’t be ticked if my bushes/shrubs/trees were in fact making it difficult for anyone to read the meter. The fact of the matter is, there is a spruce tree beside my house, and you can only get to the meter by going to the east of the tree, since the branches on the west side are thick. But dude – if you can’t get around that way, did you think about going around the OTHER way ? Besides, the tree’s been there for 15 years and this is the first time Terasen’s had trouble finding it’s way to the east. The other thing that ticks me off is there is absolutely no contact information on this letter. There’s a number and email if I want to start reading my own meter, but no follow up contact for the offending bushes/shrubs/trees. This is just plain rude and annoying. The letter is signed “Terasen Gas”. Ok, so the company is writing to me now ? True, the letter is ‘Per: szd”. But who or what is that ? They were good enough to include their file name in the footer though, like that’s helpful. 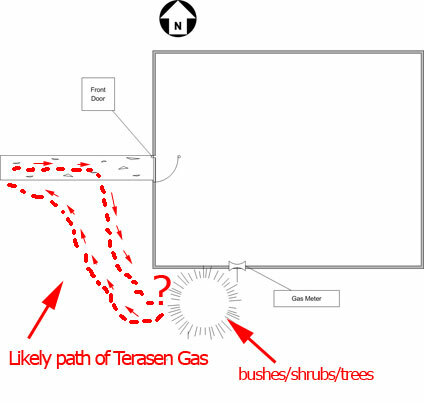 In any event, I think I’ll just post the map up by the tree for the next time Terasen Gas comes by. Or, if Terasen Gas wants to trim my bill by 13.3 percent, I’d be happy to trim the tree. Previous PostWhat Keeps Me Up At Night.Next PostWhen Did It Become the 70's Again ?